Okay, this is some SERIOUSLY good shampoo and conditioner, right here. And I have played guinea pig to loads of various hair 'cleansers' and 'softeners' over the years, y'know! It's the Sunsilk Haircare Co-creations Expert-Perfect Straight, by Yuko Yamashita. "Sunsilk Co-creations Expert-Perfect Straight by Yuko Yamashita seal in straightness. By penetrating the hair fibre the conditioner hydrates each strand of hair from root to tip. Straight Lock Technology will bind the hair together into a simple straight style. The shampoo and conditioner help to manage and maintain the straight shape of your hair as it dries." Exceptional. I whipped this out on a whim - my hair needed extra moisture, and while I didn't want to go dead-straight [my hair has a natural kink], I was desperado for some hair softening. My hair was a tad parched. It lathers up so beautifully - the kind of lather you wish all shampoos had, leaves a lovely scent, and when you apply the conditioner the softening is instantaneous. Boom, soft, done. Comb it out under water and hair is like silk. I was smitten. I then add several spritzes of the Sunsilk Haircare Co-creations Expert-Perfect Straight Detangling Mist by Yuko Yamashita. 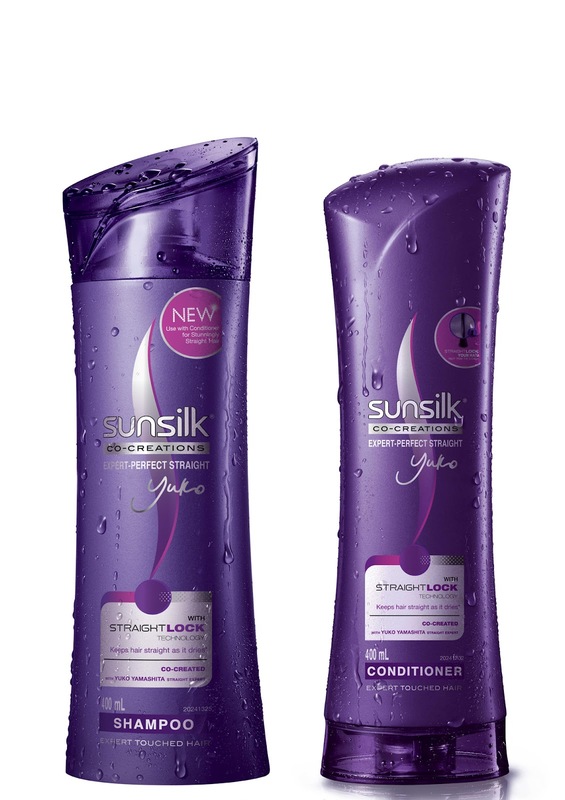 "Sunsilk Expert-Perfect Straight Detangling Mist is specially formulated to manage and detangle messy hair on the go. Its light, non-sticky texture means you can easily refresh your look anywhere, whether your hair is wet or dry. Enriched with Straight Lock Technology, the mist binds the hair together helping to create a straight style." Just a few squirts of this transformative liquid was all it took for my hair to be instantly detangled. It was then a matter of whipping out the hairdryer and - with drying time seemingly cut in half thanks to how manageable my hair now was - hair was left incredibly silky soft. So impressed. Available at all supermarkets, now.